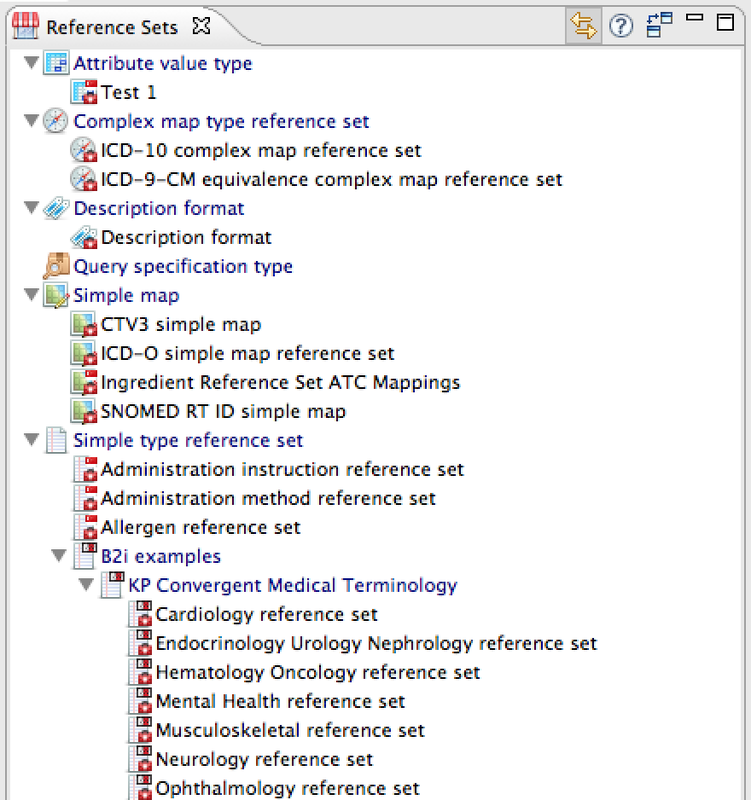 Reference sets are grouped by type in the reference set view. The categories can be collapsed and expanded by clicking on the triangles. It's also possible to create folders within a category to group several reference sets for easier navigation (e.g. B2i examples folder in screenshot). The reference set view can be linked to the editor using the button in the tool bar, clicking the button again will unlink the view. Right-clicking a reference set will bring up the context menu. Reference set icons also indicate their included components (e.g. 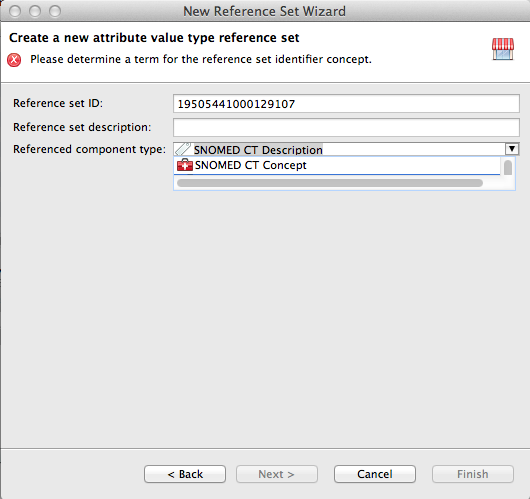 SNOMED CT concept, ATC concept, description, etc.) via a small indicator (a "decorator") on the bottom right of their icon. The module of a concept is indicated by a small decorator on the top right of the concept icon. National extensions can be identified by a small flag of the country. Click on the respective button in the toolbar to bring up a wizard for the chosen type. You can also use the context menu in the reference set view: Right-click on the folder of the type you would like to create. Make sure you are right-clicking a folder (e.g. Attribute value type) and not a reference set, since this will bring up a different context menu. Alternatively, you can use File > New > Snow Owl > Reference set in the main menu. 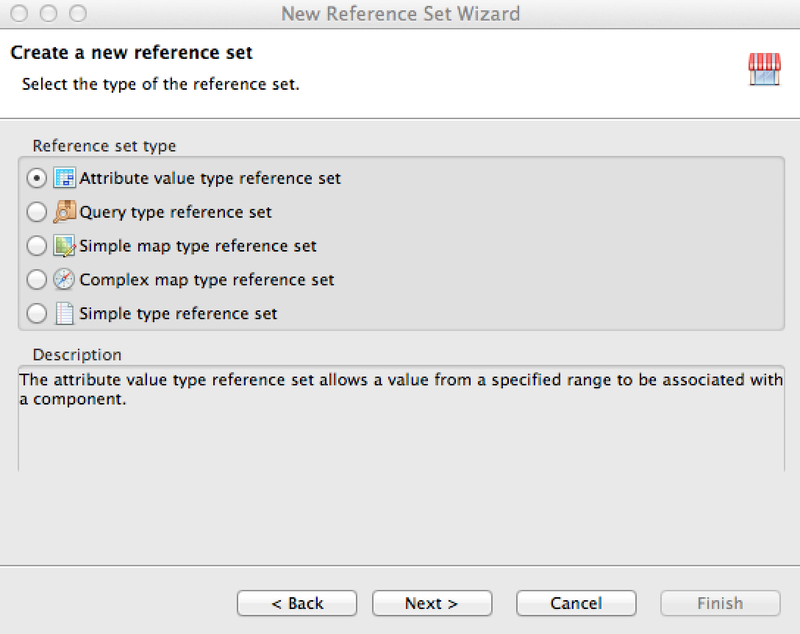 This will bring up a dialog where you can pick the type of reference set. Reference set ID: An ID is automatically generated. Reference set description: Enter the name of the reference set here. Referenced component type: The simple type and the attribute value type reference sets can have concepts or descriptions as referenced components. Choose a type from the drop down menu. Hit finish to create an empty reference set in which you can add members. You can see that the reference set was added to the reference set view. 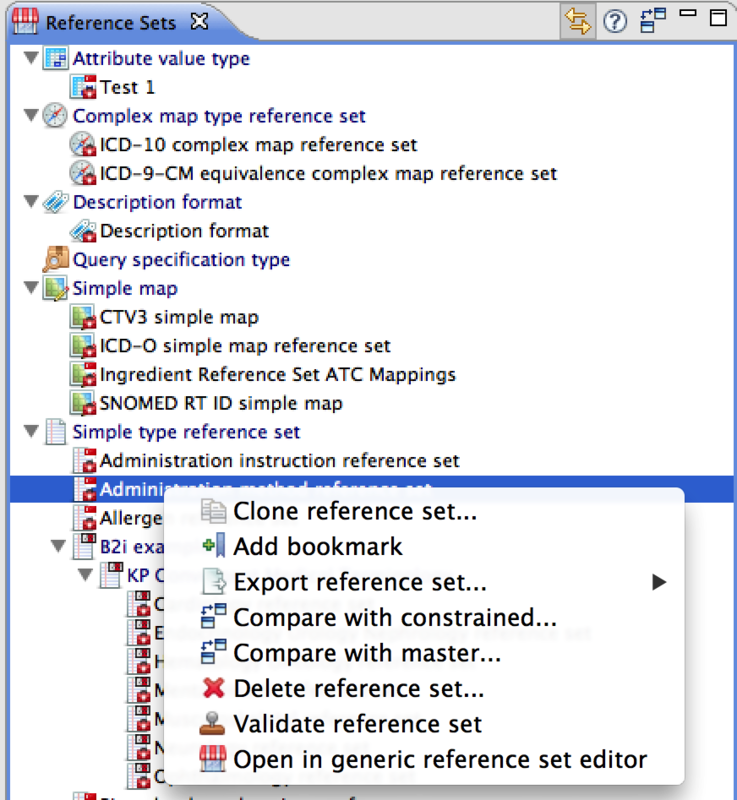 Reference sets can be validated to ensure that all referenced components are active. The validation can be invoked by right-clicking the reference set in the navigator. The validation errors are displayed in the Problems view, and error-decorators are also added to the reference sets and reference set members where erroneous components are found. The problems view displays additional information about the erroneous members. Note that in this example, the refset member is active (indicating that this component is a current part of the refset), however the referenced component itself (Infection by Babesia equi) is inactive. It's possible to constrain or extend a reference set by creating a clone of it and adding modifications either manually or by using lexical or semantic queries. The master reference set will remain the same, while various versions can be created with the clone mechanism for modifications. 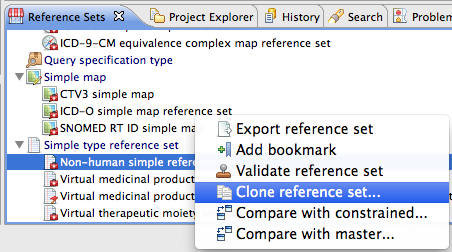 The clone action can be invoked by right-clicking the reference set in the Reference Set navigator. Enter the name of the new reference set, an ID is automatically generated. Click Finish to create a clone. 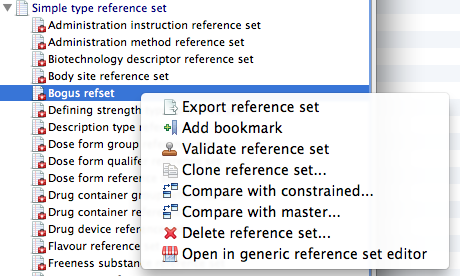 Reference sets can be deleted directly from the reference set view by right-clicking a reference set and choosing the delete option. 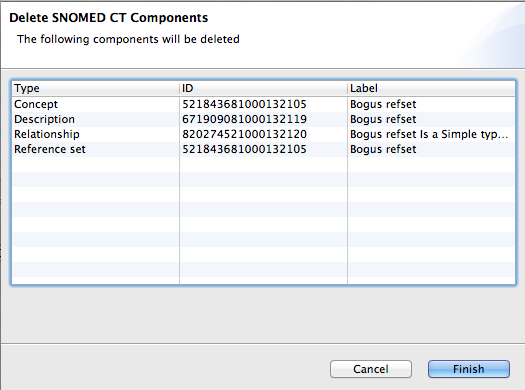 After choosing a reference set to be deleted, a confirmation window displays the SNOMED CT components that will be affected by the deletion. Only unpublished reference sets can be deleted.